The Burj Al Arab silhouette has become iconic for Dubai and the self-titled “world’s only 7 star hotel” celebrated its 15th anniversary (it opened December 1999). Instead of 15 candles on a cake, the Burj went with 15 bespoke gold iPhones. Crafted by Gold & Co London (which had previously supplied the hotel with golden iPads), the commemorative iPhone 6 units come in Yellow and Black Gold. There’s only 15 of them and they ca only be purchased from the Burj Al Arab. Each features the anniversary logo on its back and takes 80 hours to complete. 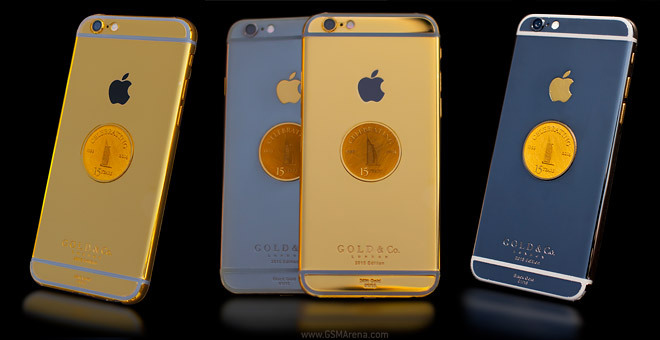 The bespoke iPhones come with gold-plated authenticity plaques that bear their number and IMEI. The Black Gold option is AED 47,900 ($13,000/€11,500), while the glitzier Yellow Gold option is AED 44,900 ($12,200/€10,800). Add a two-way ticked to Dubai unless you’re already there. Note that there are “regular” yellow and black gold iPhones too that go for AED 21,900 ($6,000/€5,300), but without the collector’s value. Thanks to Shayne for sending this in!